Happy Halloween! Finally in the mood to do my wine pairing, a special bottle jumped out at me. Pale caramel and clear, aromas wafted up as soon as I lifted the cork. In the glass, aromas of peach brulee with a soft underpinning of petrol. a small twist of lemon, and a touch of cellared apple. Satiny and medium bodied, the wine has flavors of honey, apples, peach, lemon and love. While the sweetness is up there, the acid in the wine keeps the taste light and refreshing. 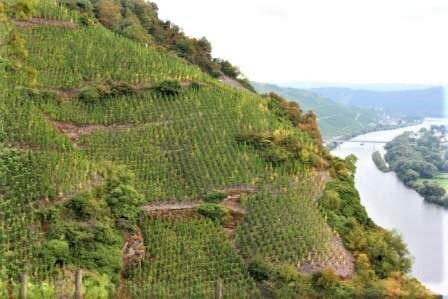 From a food paring perspective, Rieslings are a gift. This wine in particular has a satiny, medium plus bodied texture. Its elevated sweetness would pair well with spicy cuisines. In this case, I paired it with tart-sweet, acidic Smarties. 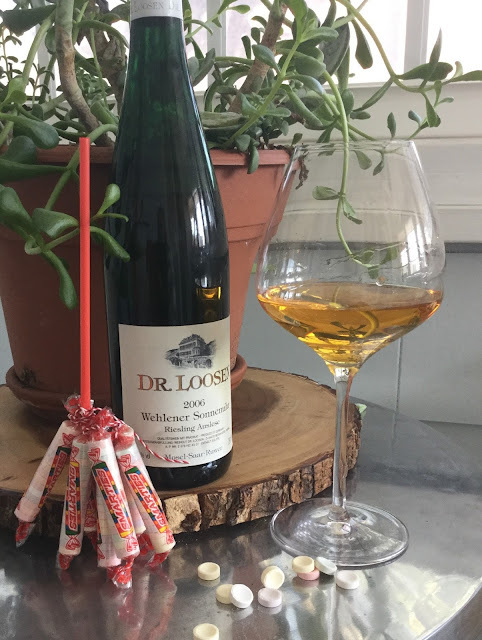 I might be late for my Halloween newsflash, but I am starting early with the wine and candy! Note the crafty last minute touch of Witch's Broom Smarties Bouquet, which I hand crafted with bakers twine and a straw.